Tucked away in the corner of the newly refurbished Trinity Indoor Market is the charming Tea Shop. Owned by the lovely Marion Ring, this loose leaf emporium is jam-packed full of glass jars, each storing a different aromatic blend. I was lucky enough to sample some of the herbal goodness after chatting with the tea lady on the stall. "Did you know that all tea comes from the same plant?" she asked me. I didn't actually, which is quite shameful when I'm a bit of an enthusiast about the stuff. All tea comes from a small shrub/tree called Camellia sinensis. We get different types of tea depending on where this incredible little plant grows and how we process it. What I found most interesting is that Marion herself creates her own blends. For Hull UK City of Culture 2017, she has come up with an array of flavours to celebrate local heroes. Poet Phillip Larkin has been immortalised with a smokey blend of Early Grey and Darjeeling. Meanwhile, famous Hull-born MP William Wilberforce has his own African-spiced beverage. Mick Ronson, on the other hand, is a fruity number. "I just have a play about with the flavours and see what I come up with, it's so fun," Marion chuckles. Overall, The Tea Shop stocks over 150 different types of loose leaf tea, as well as novelty teapots, mugs and coasters that are specially made for the stall. I tried the French Lavender Earl Grey, Rhubarb and Custard, Mumbai Chai and Orchid and Rhubarb. They were all truly delicious. I've even sent a few packets back home to my mum, who loves indulging in tea during her breaks at her hectic school workplace. This tea is ideal for the colder months. The ingredients of cinnamon, ginger and cloves give the drink a lovely warmth. Chai is actually Marion's favourite type of tea, I discovered. This fun flavour is super fruity and easy to enjoy on a sunny day. 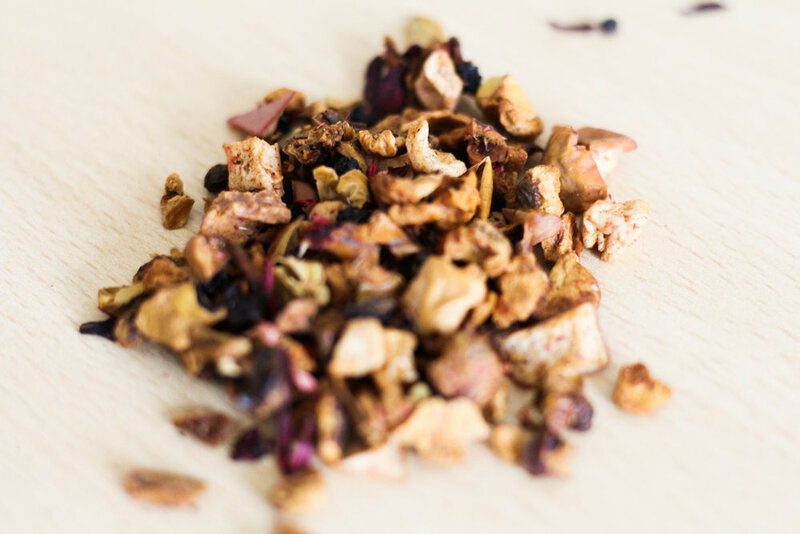 Admittedly, I'm not a huge fan of fruity teas but if you are you'll love this sweet treat. This green tea still has hints of the fruity rhubarb and raspberry flavour, but that's toned down by the green orchid tea. As you may know, green tea has many health benefits. It's believed that it aids weight loss and combats all sorts of illnesses and diseases. The French Lavender Earl Grey is by far my favourite of the bunch. It's the perfect way to wind down after a busy day of writing. I love to pop one of my homemade lavender wax melts on, sip the tea and get ready for bed. The Tea Shop is located in Trinity Indoor Market and is open Tuesday to Saturday, 9:45am until 3:30pm. Marion will help you decide on what delicious flavour to buy, depending on your taste buds. You can also buy her tea online via The Tea Shop website.